Mike grew up in Hawaii and did not wear shoes to school until high school. It simply wasn’t required. Absurd, right? I was flabbergasted when I found this out, and figured he had to be stretching the truth. But no, his childhood was just that great. Living a block from the beach, swimming every day, cutting school to go surfing, building his own sailfish and eventually teaching himself to shape surfboards. Then, surfing professionally. He is one chill dude. I, on the other hand, was a Midwestern kid who stood at the school bus stop in a blizzard, swathed in snow suit, snow boots and the ubiquitous scarf wrapped around my face…the scarf that eventually freezes to a kid’s face with snot. My childhood was spent plotting ways to get out of Dodge at the first available opportunity. And here I am in Maui. How did Mike and I end up together? Everyone knows opposites attract. He is the uber-surfer, fish-in-a-previous- life guy. He’s had so many careers people can’t keep up, and they all involved water: he was a diver for black coral (back when it was legal) diver for tropical fish (ditto), professional surfer, Boat Captain, and was a Fireman on Oahu. He was recruited to jump out of helicopters and rescue people. You saw the movie “The Guardian”? That was him, but in Hawaii and warm water. Big, big waves. On the North Shore of Oahu, tourists constantly get too close to the water and get snatched off and hauled out to sea by those big waves. The water will look so innocuous, while the tourist is busy searching for shells or sea glass… and then WHOOSH! they are gone. And Mike was called in. I’ve seen him walk up to total strangers on the beach and warn them that the surf is too high. And what do they do? Ignore him and let their five year old keep playing right at the shore line. That’s what those orange flags mean, folks. It doesn’t seem that Hawaii would be a place fraught with danger and drama, but oh, how it is. 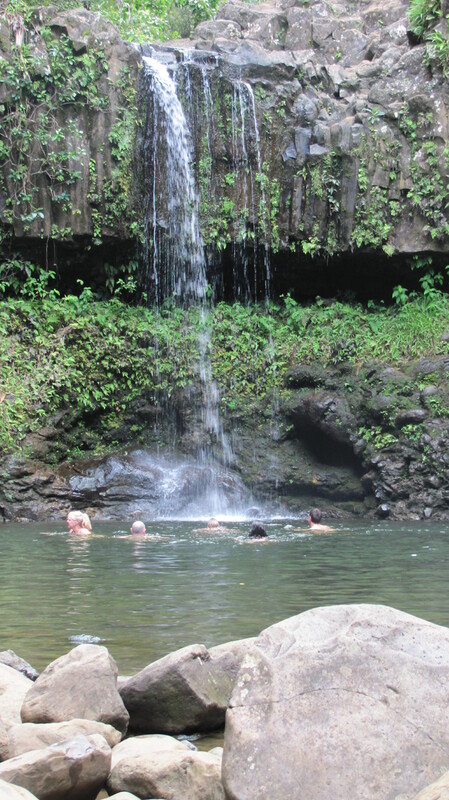 I almost drowned the second time I hiked on Maui. I had waded across a stream (out towards Hana), and was sitting on a big boulder communing with nature and eating a sandwich. I was so content and languid, like a big snake sunning itself, happy and warm. Then I detected the sound of the water rushing just a bit faster. Then faster. And then so fast I was scrambling off the rock, trying to comprehend it. How could this be happening? It was a stream, for God’s sake. I found out later that those streams feed the water supply from the mountains, and the Powers That Be had opened the flood gates to feed more water to the people. I literally had my life flash before my eyes as the water rose and I struggled with everything in me to wade back across what had been a stream of water but was very suddenly an angry, rushing river. The only thing I could think of was that I had no identification on me and that my mother would see a newsclip in California about an unidentified hiker drowned in Hawaii, and she would never know it was me. Suddenly, there was a flash flood. (What seems like a little rain in the rainforest is a giant storm up in the mountains). I saw the stream rising and knew immediately that we had to get out. I told the girls we had to leave, but they balked. They were too busy having fun! I insisted. People were already struggling to get back across the stream, slipping on boulders and joining hands to stay upright. And yet, the families who had just arrived, who were headed into the rainforest? Clueless. And poo-poohing my warning that the water could take their children down and under. They just didn’t care; they had driven all this way and were determined to hike and swim under the falls. I wonder to this day if those kids all made it out in one piece. Just like those people who ignored Mike on the shoreline. When in Maui, boy-howdy it’s wise to listen to the people who live there…it could save not only your vacation, but your life. This entry was posted in Uncategorized and tagged danger on beach in Maui, fireman, hiking in maui, hiking on Maui, professional surfer, surfer, waterfall by jamaicawtr. Bookmark the permalink. 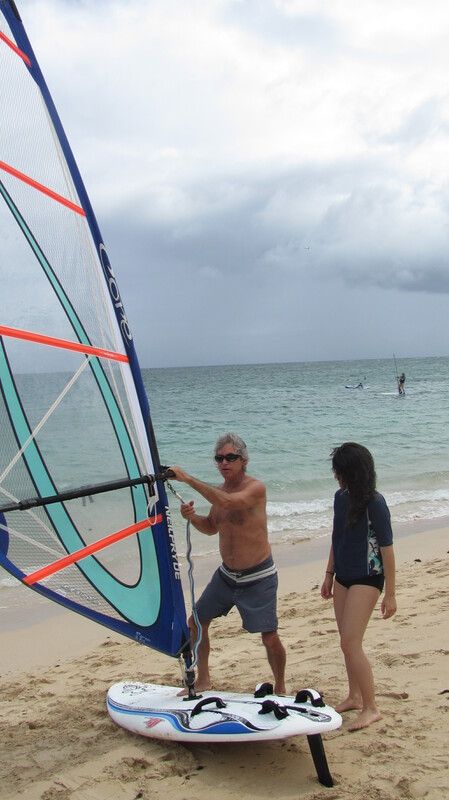 When we vacationed there for our 1st time, we were told….If the locals are not in the water, you dont go in the water…….We followed that advice and will always continue. My husbands company brought us there the 1st time and .had one of those team building events in the water. We had to build cardboard boats and paddle them out a little way and then come back. The current was so strong that when I had hopped out and tried to pull the boat in the current pulled my legs the opposite direction and I twisted my toes and broke the two middle ones. By the way, isnt it funny that as much as you all hate the red dirt, its the number one souvenir that tourist want. The Red Dirt Shirt! My husband has two! Aloha! Your broken toes are a perfect example. It’s always much more dangerous than it appears. I swam out at Black Rock in Kaanapali to try to see the turtles when I first moved here, and got caught in a riptide and barely made it back in. And this is the “calm” water where they teach the keiki (kids) to snorkle!